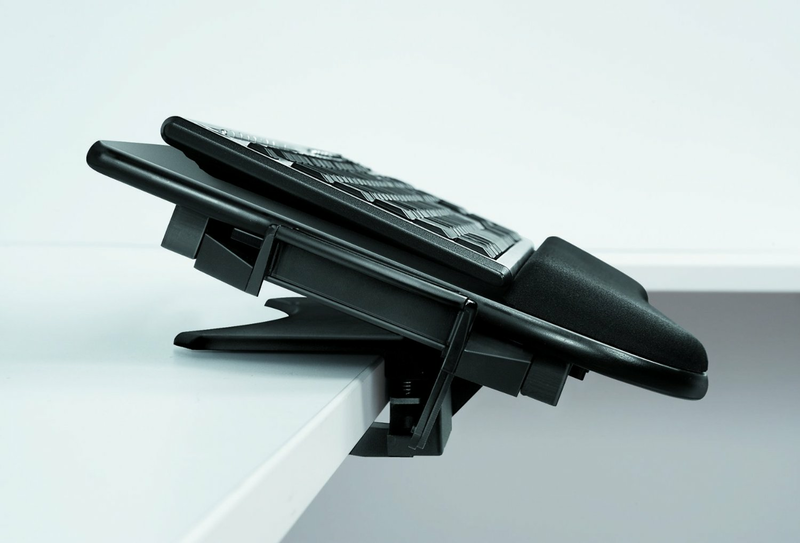 Experience first class comfort with the innovative new Tilt ‘n Slide™ Keyboard Manager! The new Tilt ‘n Slide™ Keyboard Manager offers more leg room, plush wrist supports and a reclined seating position. Experience the perks of first class comfort without leaving your office! This first-to-market keyboard manager attaches to your desktop edge without tools for simple installation – slide the keyboard manager onto the desktop edge, use the levers to adjust the two clamps, and tighten the knobs. This keyboard manager gives you extended knee clearance to keep you comfortable while typing and mousing. The Tilt ‘n Slide™ Keyboard Manager also puts you in a slight reclined position in order to help you to avoid lower back pain, fatigue and discomfort. A single lever easily adjusts the tilt (flat to 30°) and slide (4-5/8” travel distance) of the keyboard manager for customized comfort. 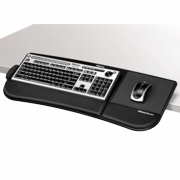 In addition, the Comfort Glide™ System allows the mouse tray to slide over or away from the keyboard numeric pad in order to keep the mouse closer to you for more comfortable use. The ultra soft memory foam wrist supports provide added comfort and include Microban® antimicrobial protection to keep the product cleaner.